The STIGA Advantage Table Tennis Table is constructed with the use of finest raw materials. It is another entry-level indoor table created by renown ping pong equipment manufacturer with the norm of maintaining the highest standards of quality in the industry. What’s Good About This Table? The table is featuring 1/2″ steel apron providing warp-resistant support. It is a very solid table that built with quality materials and being sold for very affordable price. An added advantage of this table is the table top is professionally finished by applying the process of automated roller coating; while the silkscreen striped average top creates a perfect bounce for smooth and consistent play. The table is features with easy release safety latches secure table top and playback in storage positions. The safety latch that being implemented under the table providing a very firm and secure lock in for the top to be in the upright storage position. 1″ steel legs provide added support for a consistent and level playing surface. 2″ wheels allow for easy and smooth mobility for storage and transport. 3″ lockable wheel casters make the table stand out. By having a larger size compare to other table, moving this table to far distance is not an issue at all. QuickPlay design with 95% pre-assembled to offer users with easy and quick setup. Standard net and post included with table which are very easy to install and take off. These equipment that come together with the table are pretty good in quality. The craftsmanship of the table is more than good which cna provide player with very good and even bounce when hitting the ball on the table. 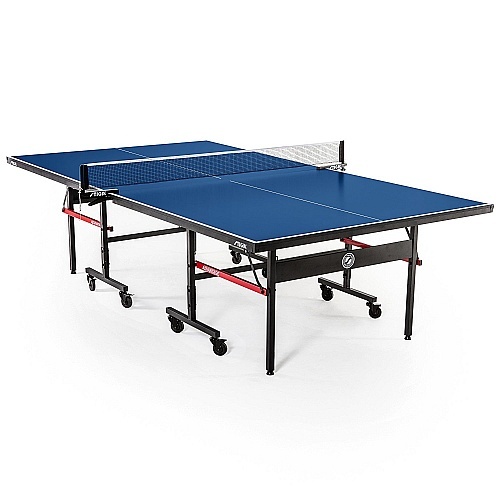 The STIGA Advance Table Tennis Table also features playback and storage position. Which mean you can fold the table at 90 degrees and move them away. The installing process generally is quite simple without much effort needed. It required you to have a wrench to tighten the bolts so that the table can stay firm on it’s position. The disadvantage of this table is that it is not a tournament standard table. Which mean you may not going to have a professional feel by practicing your skill with this table. Thus, this table is ideal for beginners or intermediate players. If you love to play ping pong very much for your free time, but do not wish to pay too much for a table, then you may consider of buying this STIGA Advantage Table Tennis Table which can be the right choice for you to have it with affordable price and having fun with it. If you don’t think this table is right for you, there are still many different models of STIGA table tennis tables that you can choose from.